We use state of the art computerized engraving machines to deliver the highest quality engravings. Wood, Bone, Aluminum and Plastic handles are laser engraved. The Standard Engraving process is using Diamond tipped bits to engrave into the steel blades. The fonts used for standard engraving are: Vanessa for the Script or Goudy for the Block. Please note that engraving a word using Script Font in all capital letters will NOT look good. The first letter in a word can be capitalized and the rest of the letters must be in lower case. You can capitalize all letters when selecting the Block font. For initials, we recommend the Block font. 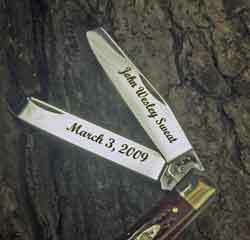 The image below is our Standard Engraving in Block font on a blade.